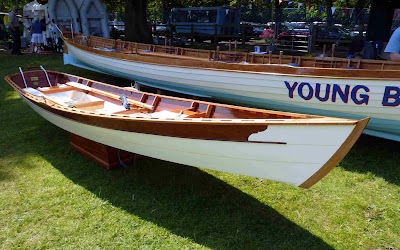 The Slipway Co-operative in Bristol who built the Cornish pilot gig Young Bristol, also showed a smashing rowing skiff at Beale Park, the Whisp designed by Steve Redmond. The Whisp is about as simple a boat as can be, but Win Cnoops and his fellow-craftsmen have created a lovely thing from the design. The boat is 15ft 9in long by 3ft 6in beam, and a draft described as 'very little', so it should be easy to row and especially handy when landing on beaches or slipways. It weighs about 70lb so can be carried on top of a car without too much difficulty. The rowing version is available complete from the Slipway Co-operative at £3250, or in kit form at £1500. A spritsail rig is also available. Plans for the Whisp are here.